How to Cite This Chapter: Brito JP, Jarząb B, Płaczkiewicz-Jankowska E. Toxic Multinodular Goiter. McMaster Textbook of Internal Medicine. Kraków: Medycyna Praktyczna. https://empendium.com/mcmtextbook/chapter/B31.II.9.2.2 Accessed April 23, 2019. A toxic multinodular goiter (MNG) (MNG with functional autonomy) is the end stage of the development of MNG, often caused by iodine deficiency (Figure 1), in which the nodules show autonomous secretion of thyroid hormones independent from thyroid-stimulating hormone (TSH) due to somatic mutations of the TSH receptor. Hyperthyroidism usually develops very slowly (the presentation of overt disease is preceded by a subtoxic MNG with subclinical hyperthyroidism [see Thyrotoxicosis]), but it may also occur suddenly after exposure to large doses of iodine, for instance, in the contrast media or drugs (amiodarone or certain disinfectants). The enlargement of the goiter or appearance of a nodule is frequently unnoticed by the patient. If the goiter is large, the sensation of neck compression may occur with dyspnea or, much less commonly, dysphagia and cough. 1. 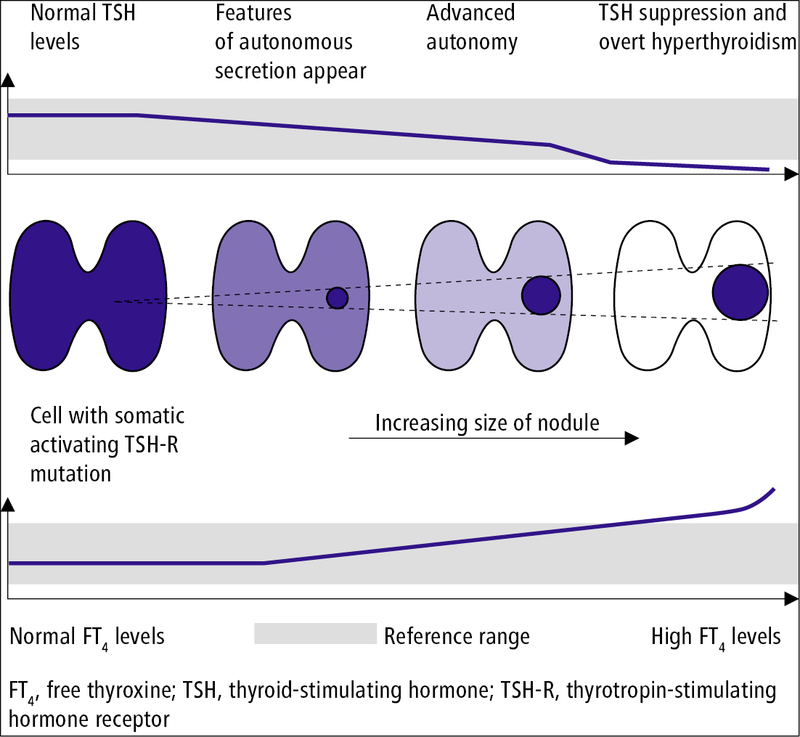 Hormone tests: Significantly decreased TSH secretion and significant elevation of serum concentrations of free thyroxine (FT4) and free triiodothyronine (FT3) (or FT3 only). 2. Imaging studies: Thyroid ultrasonography is used to measure the goiter size and accurately assess the nodules. Thyroid radionuclide imaging is helpful in an accurate evaluation of the uptake of radioactive marker and identification of autonomously functioning nodules, which are the basis for the decision to start radioiodine therapy. 3. Cytology: For autonomously hyperfunctioning nodules observed in thyroid radionuclide imaging, fine-needle biopsy is not suggested due to the low risk of malignancy and increased risk of indeterminate results (see Thyrotoxicosis). For nonfunctioning nodules, the indications for fine-needle biopsy are the same as in nontoxic MNG. A visible or palpable multinodular goiter of varying size (the key feature is the presence of ≥2 nodules >1 cm in diameter found on clinical examination or on ultrasonography) with concomitant hyperthyroidism. Other causes of thyrotoxicosis (Figure 1 in Thyrotoxicosis). See also: Graves Disease, Toxic Thyroid Nodule. 1. Pharmacologic treatment: Thionamides (see Thyrotoxicosis) reduce the symptoms of hyperthyroidism (they should not be combined with levothyroxine), but their discontinuation invariably results in the recurrence of hyperthyroidism (after a period from several days to several months). Beta-blockers are used as in other cases of hyperthyroidism, but in toxic MNG, higher doses than in Graves disease are often required because of the more severe cardiac symptoms. Radical treatment is necessary, with either surgery (usually subtotal thyroidectomy) or radioiodine treatment. The treatment modality is individually selected in every patient (Table 3 in Thyrotoxicosis). 2. Radioiodine treatment: The radiation sensitivity of autonomously functioning nodules is lower than in Graves disease (this must be considered when planning radioiodine treatment). Nonfunctioning nodules do not respond to treatment and most functioning nodules are only reduced in size and do not disappear; nevertheless, remission of hyperthyroidism is achieved (in approximately one-fourth of patients, repeated radioiodine treatment is necessary after 6 months). The radioiodine treatment is usually selected for patients with small goiters and no features suggestive of malignancy and in patients with contraindications to surgery. 3. Surgical treatment is required in patients with nodules revealing cytologic or clinical features suggestive of malignancy. It should also be considered in patients with large goiters causing compression symptoms, particularly if nonfunctioning nodules are present. Untreated toxic MNG increases the risk of arrhythmias, other cardiovascular complications, and thyrotoxic crisis. The risk of malignancy is the same as in other forms of nodular goiter. Figure 1. Development of an autonomously functioning thyroid nodule.